Reminiscing about my childhood is one of my favorite things. Remembering summer days spent at Grandma and Grandpa’s, every season celebrated through fun events at school, and my parents always making each holiday special for my sister and I. 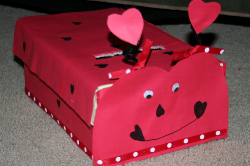 One memory I hold dear is the time my dad and I spent turning an old cardboard shoebox into a beautiful valentine mailbox. Each year we would try to be more creative than the last. One year we made a ladybug (which was my favorite). Another year we spent hours tirelessly hot-gluing sequins on my mailbox’s mermaid tail. What I remember most, though, is the time we spent together. Now as an adult I look around my classroom and walk through the halls of Hickory Hills and see the walls flooded with red and pink sparkly hearts and cute Cupid babies. Yes, it is that time of the year again folks...the month to celebrate love. Whether you have a valentine or not, the gift of love God sent us through His Son Jesus is worth celebrating. Valentine’s Day falls on Wednesday this year, and we will celebrate as a church family the love we have for Jesus and the love we have for one another. Mark your calendar for Wednesday, February 14th, for our Church-Wide “Love One Another” Valentine’s Dinner. Dinner will begin at 5pm, so please mark your dinner option on the pink slips available at the Information Station or on the tables in the fellowship hall this Wednesday night. We will have a photo booth, Valentine Bingo, and a time to create Valentine’s cards for Harmony House, a shelter for survivors of domestic violence. Let’s look to 1 John 4:19 as we live life together and celebrate the love we have in Jesus: “We love because He first loved us.” Let’s spend time loving one another as we fellowship together on Wednesday, February 14th, at 5pm.